The drummer Warren "Baby" Dodds is best known for his jazz improvisations. 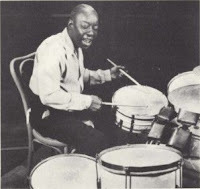 He was one of the first drummers to be recorded improvising while performing. Furthermore, because improvisation is so core to jazz, Dodds is known for his role in the development of jazz as a genre and drum solos in general. In the book The Baby Dodds Story by Larry Gara (1959) includes references to some live radio broadcasts Dodds made in 1947. "In 1947, while I was broadcasting on Rudi Blesh's "This is Jazz" program, I made some records from the broadcast. I had also done some broadcasting years before, in 1927 when I played with Hughie Swift's band in Chicago's Jeffrey Tavern. We had a special broadcast show worked out which took a half hour every week. " Ever the musician, Dodds recollection goes on to detail the arrangements and the players but not dates, times, or call letters.The program "This is Jazz" is well known. The program originated at WOR Studios in New York City. Known recorded sessions began in January and continued until 1947 of that year. [Discography here] The Jazzology label released most of those sides, and Dodds is all over "This Is Jazz: The Historic Broadcasts, Vol. 2" if you want to give a listen. *It's worth noting that that at that same venue, Swift was followed by another jazz group led by Sammy Stewart with Ikey Robinson and Sid Catlett who have all the same claim to that particular radio first.